Did you know that your hair and scalp need protection from the sun too? It’s a no brainer really, however, no one really talks about the damage the sun can do to your hair. Exposure to the sun fades hair colour and dries out the strands leaving it looking brassy and feeling dry, so protecting it is just as important as protecting your skin during the summer. Rita Hazan who is the genius colourist for Beyonce and J Lo’s hair knows a thing or two about hair. 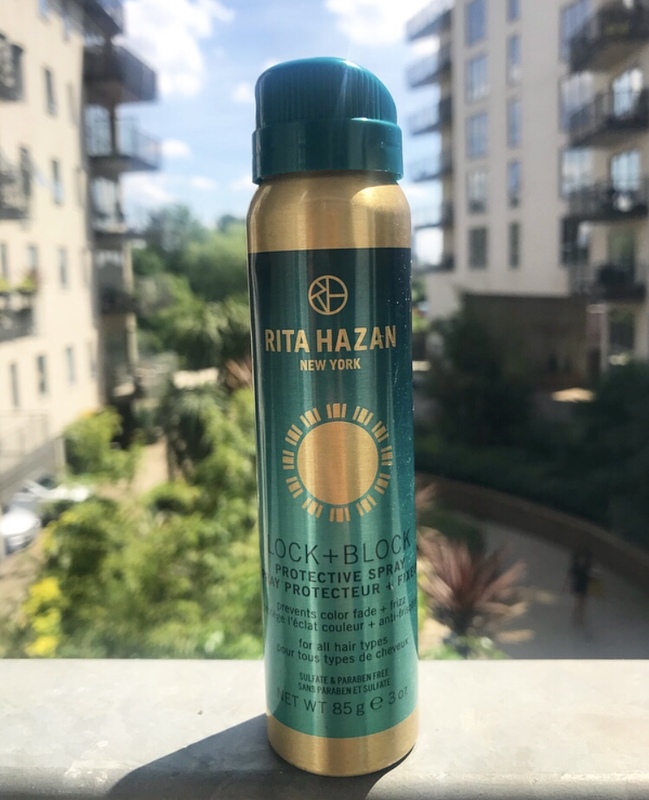 Her new multi-tasking Lock + Block Protective Spray protects hair from UV damage, humidity, protects colour, the condition and acts like a hairspray. It’s a dry spray which Rita wanted instead of an oil based UV protector which normally weighs hair down. Formulated with nourishing vitamins A, E, and B5 to provide an extra dose of antioxidants and shine for smooth, glowing, healthy-looking hair, wherever you may be. As I’m not heading to a beach this summer I have been testing this out during the hot days we’ve been having in London. The instructions tell you to spray directly onto wet or dry hair making sure to cover from roots to ends. Rita recommends re-applying periodically if you are in the sun all day. If your hair gets wet you can spray as much as you want as soon as you get out of the water and let it air dry. The first time I tried it I sprayed it onto dry styled hair and didn’t like it as it felt like hairspray. It did disappear and my hair felt normal after a while but I don’t ever use products apart from oil to my hair so it wasn’t for me. Too be honest, Sun cream always feels heavier than normal cream so I compared it to that sun cream feeling. When I applied it onto wet hair before drying it was much better, my hair felt great as I didn’t notice it was on so it was completely weightless. The packaging is so cool, it doesn’t have a lid so all you to is twist the cap and it clicks to reveal the nozzle. It smells amazing, Rita Hazan’s signature tuberose and jasmine scent. This is a summer must have item and it’s small enough to fit in your hand luggage.